Last week, we shared a video showing the new TKO Nozzle (Turbo Knockdown and Overhaul) extinguishing a car fire using only a few ounces of F-500 Encapsulator Agent in about ten seconds. Think about how you could use this nozzle for rapid deployment using a 1 ½” hand line. 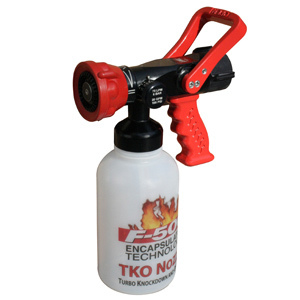 The F-500 EA gives this small nozzle tremendous impact on Class A, B, D fires and even moderate fuel spills. The two quart bottle of F-500 EA can easily encapsulate up to 4 gallons of E10 ethanol-blended gasoline, diesel fuel or any hydrocarbon. Need more F-500 EA? The bottle can be changed in seconds. Read more about the impressive TKO Nozzle, then contact us.